January 19 will be the date. It will only be roughly four months from the UK release date but who’s counting. The Editors’ new record In This Light And On This Evening will finally reach our shores via the FADER label. Of course, there are those who decided to give the finger to the archaic territorial release date nonsense and downloaded it or bought it as an import…like me. Those who haven’t and decided to wait, let me simply tell you it is worth the wait. The record is solid as solid comes. Editors with an electro twist and the anthems are still abound! What’s even better is the news that the band will come Stateside in February for a tour. Needless to say, it’s a show you don’t want to miss if they are in your town. Here are the dates! It isn’t often when you come across a piece of music so cold and so relentlessly haunting that you simply must take your temperature afterwards to make sure you haven’t lost a couple of degrees. Coming across Germany’s Konstantin Gropper who performs under the moniker Get Well Soon, it was quite a revelation to see that dark chamber pop music isn’t dead. Gropper’s new record entitled Vexations is due out in January but methinks I won’t be able to wait that long to get my grubby paws on this record based solely on the beauty of the first single featured here entitled If This Hat Is Missing I Have Gone Hunting. I hesitate to use the words goth or gothic to describe the song or the artist simply because of how cliche and boring the genre is but there are definite overtones here right down to the accordion, the minor chords and of course, Gropper’s stentorian baritone vocals. It really is a beautiful track. Granted the song lyrically talks of rationalising suicide from a man to his girl, it is still a very pretty arrangement and still a quite brilliant pop moment in my humble opinion. If you’re like me and not afraid to delve into the darker shade of pop music, definitely give Get Well Soon. They should find a bigger audience with the new record and it would be well deserved! It’s out 25 January via City Slang. whatever happened to the muslims? I’ve recently made a revelation. Most, if not all, of the music I’ve been covering in this here blog has been focused primarily on artists and bands who call New York or England their home. Naturally there have been some rare exceptions along the way but for the most part I’ve been kind of predictable. Allow me the opportunity to make a slight deviation from my tried and true formula. I’d like to present a pretty spiffy indie rock band that’s been making some waves for the past year but is about ready to drop their eponymous debut that will be sure to rattle the senses soon enough. The best part? They’re not from New York and they’re not from London or Manchester either! Nope. The Soft Pack come to us from the sunny and very friendly confines of San Diego, California. When this band first started out, they were known as the Muslims. Personally I thought the Muslims was a great name and rather ballsy given the current climate we find ourselves in. Unfortunately since we tend to share our planet and on a more micro level, a music scene with bumbling and stumbling idiots, the Muslims thought it better to change their name. Luckily for us, the name change was not followed by a change in sound. This quartet brings their tightly wound and rapid fire assault on the nerves in the form of The Soft Pack, the self-titled debut via Kemado Records on 2 February. Fresh off the release of their debut full-length Midnight Of The Century, we have the promotional film for the single Flight Of The Demoiselles. Yes, friends, it’s New York’s own Blacklist. A great video that does a great song justice. The band looks dashing, the production looks first-rate and it’s safe to say the band is well on their way. Good show, boys! So there I was at good old Webster Hall, the site where I came of age as a wee young lad dancing to house and techno music under the lights. I marveled at all at my fellow club-goers, the club kids in their beautiful outfits and outrageous antics… Those were the days…but I digress. White Lies returned to the Big Apple and brought their brooding dark post-punk missives with them. The first time I saw them was at the Bowery Ballroom along with the Soft Pack and Friendly Fires. The band put on a solid set that was tempered a bit by Harry McVeigh having throat problems. He valiantly gave it a go but his voice was considerably weak. That was most definitely not the case Friday night at Webster Hall. I came late to the venue so unfortunately I was only able to catch the latter part of the set by openers, Violens. What I did hear was very promising indeed and I’ll make it a point to see them again. Soon after 9pm, the band hit the stage. The first thing I noticed was that the band definitely stepped up their game and immediately began with Farewell To The Fairground, one of my personal favourites from the self-titled debut record. The audience had already reached fever pitch before in anticpation for the band to get on the stage and from the first song, one could literally feel the floor shake. For a band whose record really didn’t bother the US charts, it’s plain to see White Lies has already garnered themselves a dedicated fanbase who passionately sang every word to every song in the 12 song set. Any concerns over Harry McVeigh’s voice were quickly quelled as he was able to remind us again why he’s got the most expressive voice in indie rock right now in Fifty On Our Foreheads and A Place To Hide. His voice possesses such a resonance and such a genteel quality, it really enriches their sound and to me, sets the band apart from many of their contemporaries. Coupled with the band sounding much more confident and tighter than before and the reaction of everyone in attendance that the band has truly arrived and is one that won’t be a flash in the pan soon to be tossed out with the bathwater. After all, how can one discard a band who does a Portishead cover? I think not! Granted it will only have been roughly two years since the release of An End Has A Start, it made me smile to no end to discover the new brand new offering by, in my opinion, one of the more criminally underrated of the new new wave bands. 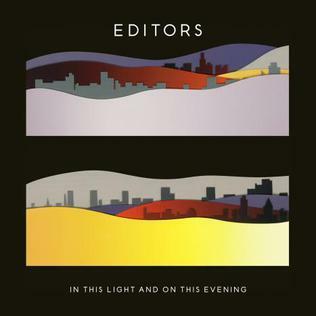 Birmingham’s Editors are set to release their brand new record entitled In This Light and On This Evening on the 13th of October via Kitchenware in the UK. The first single off the record is sure to become a live favourite and is already becoming one of my favourite songs from the band and it’s called Papllion. 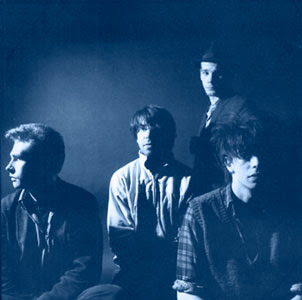 It takes the ever-evolving dark post-punk sound the band has been honing since their 2005 debut The Back Room and applies a more raw and futuristic sheen through the increased use of synthesizers. This should not really come as a surprise as singer Tom Smith stated in interviews that the band in writing their new songs had become very influenced in making a record that evoked the sound of the Blade Runner soundtrack. Listening to Papillon for the first time, I must admit Blade Runner wasn’t the first time that came to my mind. I had almost done a double take upon hearing the lead synths and thought of the band VNV Nation and their anthemic industrial pop. Needless to say, this did not detract from my going goo-goo over this track. Who says post-punk is dead?